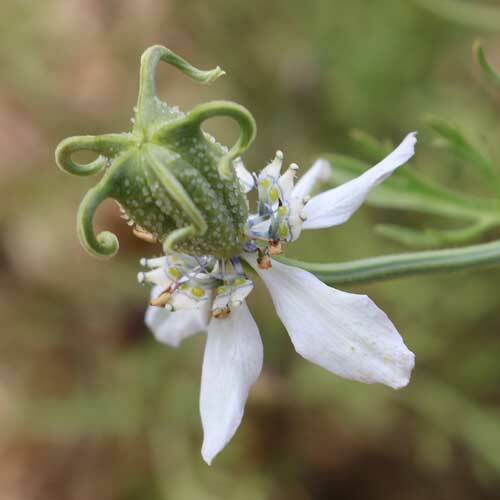 (Nigella sativa) Also known as Roman coriander, this annual herb is grown for its aromatic black seeds that may be ground and used like pepper. Feathery-leaved plants have soft blue to white flowers with downward-turned petals that resemble a skirt. Like their relative, Love-in-a-Mist, the flowers of this species are followed by ornamental pods perfect for dried arrangements. Annual. Instructions - Plant seeds outdoors just before the last frost. Will self seed profusely. Prefers average soil and tolerates dry conditions. Remove spent blossoms regularly to prolong blooming.